I recently installed Process Lasso, a process management and optimization utility. 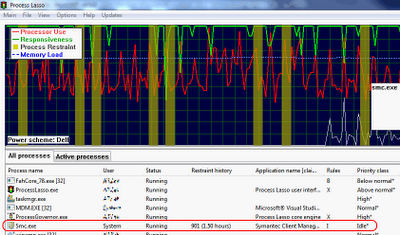 Thus far it seems to be a highly effective and versatile tool for managing CPU. Using a proprietary algorithm dubbed ProBalance™, It strives to maximize your computer's responsiveness in spite of the demands placed upon the CPU by myriad running processes. Runaway processes that might ordinarily eat 99% or more CPU can be dynamically adjusted by Process Lasso so that lag is minimized. Particularly useful is the ability to tag running processes in the GUI and assign them properties in the context menu, including process priority (to determine how valuable a process is and how much time the CPU devotes to it), processor affinity (assigning the use of one or more CPU cores in a multi-core processor to a given process), gaming mode (favors a process when it's running so that the CPU dedicated to its function is maximized), and terminate always (very handy if malware with a specific filename keeps trying to execute and hang out in memory), as well as lots of other options that extend Windows' built-in Task Manager by leaps and bounds. One example of Process Lasso's usefulness arose when I noticed today that a particular process was very frequently being restrained by Process Lasso for trying to monopolize CPU. 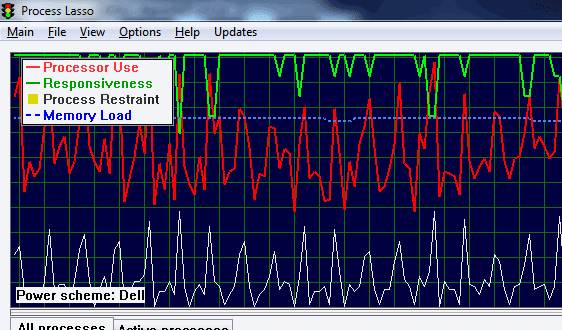 According to this note about the graph portion of the GUI, bars in red denote CPU spikes, and if you hover over these, the process name is displayed (in this case, a process called smc.exe, or Symantec Mangement Client, part of Symantec Antivirus). This particular process had, in the few weeks I've had Process Lasso installed, been restrained over 900 times, and each of the red vertical bars above denoting CPU spikes revealed smc.exe as the culprit. I decided to right-click on the smc.exe entry from the list and modify its Default Priority Class from its previous Below Normal setting to Idle. At this point I'm unclear about whether I may be compromising Process Lasso's ability to do its job by dictating to it how to treat a particular process on my system; much of the documentation recommends allowing the ProBalance algorithm to do it's thing. However, given that I've already configured Symantec Antivirus to exclude from scanning the applications and folders which I most commonly use, I'm hoping that this step will restrict it from eating more CPU than it should; the graph after the change, at least, seems to indicate that Process Lasso is not having to restrain smc.exe nearly as much as before. In general, seeing red can incite violence in human beings as well as bulls, so at least for my purposes, as far as Process Lasso is concerned, less red is a favorable outcome.